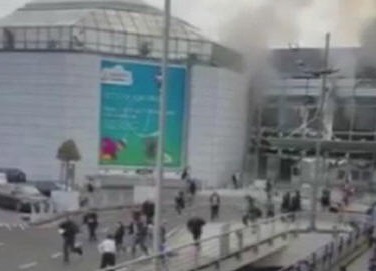 March 22, 2016 - At 8 AM two explosions occurred in the departure hall at Brussels Airport (Zaventem Airport). Emergency and rescue services are on the scene. It is believed that as many as 10 people are feared dead and over 100 people are severely injured. Witnesses report that just moments before the blast there were gun shots and shouts in Arabic. All flights at Brussels Airport have been cancelled for today and Brussels entire public transport system has been closed. Passengers are requested to contact their airline for further instructions. Airport authorities are asking travelers to avoid the surroundings of the airport. The blast occurred near the American Airlines check-in desks at the airport’s terminal by a suicide bomber. American Airlines has reported that there were no reported injuries to its employees. An hour later there was a second bombing attack at Maelbeek metro station which is located near the European Union headquarters. It is believed that 20 people have been killed and over 130 people have been injured in this attack. Belgium has raised its terrorism threat to its highest level. Today's attacks come after an anti-terrorist raid in the Molenbeek, Brussels four days ago in which Salah Abdeslam was arrested for taking part in the Paris attacks on November 13, 2015, in which 130 people were killed and 368 others were injured. Abdeslam who had ties with the Islamic State of Iraq was the subject of one of the largest manhunts in modern European history.